The space available in your kitchen should tell you whether you should opt for a kitchen island or a kitchen cart. If there is space available, opt for an island. Otherwise, a smaller cart should do well for you. The larger island lets you customize it more for your convenience. But don’t ignore the cart yet! The kitchen carts can also work like magic – storing cutlery and other kitchen essentials and hold the overflowing pans and pots and letting you move about inside your kitchen easily. If the space is more, rectangle is the shape for you and if it less, square is what you should look for. If you are looking for a smaller kitchen cart, make sure you choose one with wheels – you can move it around as per your convenience. The surfaces of kitchen carts and islands could be of many types. There are wooden and stainless steel and granite and marble surfaces and more. For heavy-duty regular work, stainless steel is your best bet. However, if you are more into baking, choose granite or marble instead. Wood is an elegant and versatile surface but it can get worn out faster than the other surfaces. When you browse through kitchen carts and islands online, you will come across myriad options for storage – these products have shelves and cabinets and drawers and what not… Some of the kitchen carts and islands also have open shelves where you can store dishes, pots and pans and accessories and have easy access to them. Crockery is highly susceptible to breakage and you can look at those kitchen carts and islands that have special drawers for these delicate items. Remember that your kitchen cart or island is supposed to be ergonomic and this means your life inside the kitchen should become simpler. Hence, it is important that you make the right choice in terms of size, storage space and options and customized areas. Even when you think that you have found the perfect kitchen cart or island, you should look at one more additional option and this option is highly important. Some of the kitchen carts and islands have drop leaves that can be pulled open or folded shut depending on the amount of space you require on the worktable. Drop leaves allow for that extra space where you can roll a bread or pizza and even cut vegetables. This wonderful option should not be missed at any cost. Also look for kitchen carts and islands with built-in butcher blocks and bread boards. While we have already mentioned about drop leaves, these extra blocks still tend to be extremely useful. You can use the space for carving, chopping and cutting. Working on the butcher block and bread board also allows you to protect the actual worktable from scratches and cuts, thus keeping it looking like new for more time. Now, there are some additional options that you may want to look at. Some of the kitchen carts and islands have space available for hanging towels and some of them have separate racks for spices and wine. Now isn’t this a wonderful addition to your kitchen? Wine is certainly needed in many exotic dishes and you may find the rack extremely helpful when it is actually there. 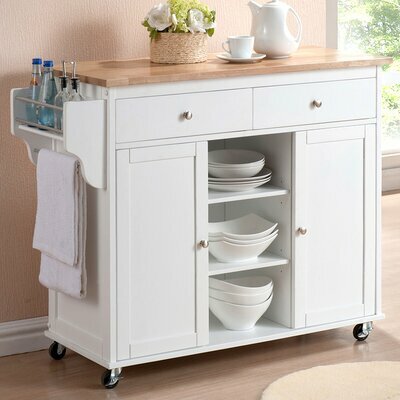 Which kitchen carts and islands for which use? If space inside your kitchen is not of concern, then opt for one of the bestselling kitchen islands. Some of the models worth looking at include Crosley Alexandria Kitchen Island with Stainless Steel Top Base, TMS Cottage Kitchen Island Base, Crosley Alexandria Kitchen Island with Granite Top Base and Kosas Home Linley Kitchen Island with Granite Top. There are no issues when you don’t have a lot of space inside your kitchen. Some of the best kitchen carts available in Canada are Baxton Studio Meryland Modern Kitchen Cart, InRoom Designs Kitchen Cart with Faux Marble Top, Crosley Kitchen Cart with Stainless Steel Top and 4D Concepts Edmonton Kitchen Cart. If stainless steel top is your thing, choose from Crosley Alexandria Kitchen Island with Stainless Steel Top, Home Styles Cuisine Kitchen Cart with Stainless Steel Top and Crosley LaFayette Kitchen Island with Stainless Steel Top.